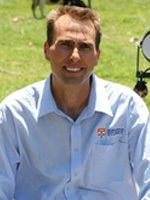 As a senior research fellow in the University of Sydney’s Dairy Science Group, Cameron is heavily involved in research associated with the integration of the farming system and technology such as automatic milking systems. In particular, Cameron’s experience as a farm systems scientist in New Zealand is helping to pave the way to turn the increasingly large amounts of data generated by dairy systems into meaningful information to improve farm productivity, profitability and animal health. Cameron works closely with farmers and domestic and international research institutes to develop novel systems and solutions for current and emerging industry needs and issues.